Have You Passed Neptune’s Exam? Some of you who are reading this line know very well what I am talking about. 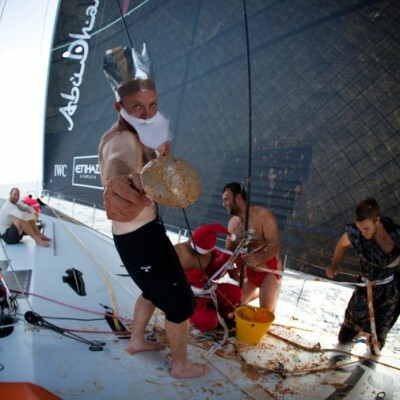 It is the old seamen’s tradition when crossing the Equator. Rookie sailors had to prove their ability to enter the world of tough, old sea dogs at the occasion of crossing the line that separates the world into two halves. The initiation of rookie sailors differ in some details from nation to nation but overall meaning is always the same, as well as the seriousness with which this ceremony is performed. All traditions mention the Neptune as the central character of the ceremony. There are also his companions and associates gathered as the ‘grand jury’. Inevitable character is always the notary who would award rookies with their certificates of competency. Of course, ship’s crew that acts as the mentioned characters is chosen with greatest care. Here we go to the central event. At this point the scenario differs from ship to ship. In one version almost naked rookies are being brought before the mighty Neptune and the grand jury. Neptune is pronouncing the most difficult questions in order to determine whether rookies deserve to be initiated into the world of real seamen. Every wrong answer is being punished by drinking the Equator cocktail. Of course, there is no right answer to Neptune’s questions so no rookie could be saved from drinking the ‘nectar’. At the end of the examination the jury reaches the verdict and allows rookies to be ‘baptized’ and embraced by the society of real (sea)men. Some varieties of the scenario mention that rookies have to drink mentioned Equator cocktail which recipe is the best kept secret (it usually consists of beer, wine, whisky, rum, yesterday’s soup, lunch leftovers, yoghurt etc.). Some old sailors remember that Equator cocktail had to be drunk from spare chamber pot but those allegations are not confirmed yet. However, all mentioned variations have always been organized and carried out with greatest care and with regard to every single detail. I do not want to mention the seriousness with which spectators have took part of the ceremony. At this point we come to the moment when all such ceremonies look all alike – the feast. Rookies are allowed to speak again – they are no longer rookies, after all. The best meals are served on the deck, the music is pleasant and all drinks are ‘on the house’. The navigation during the night of crossing the Equator (and a good part of the following day) usually seems more like one of the ship of fools, but that’s the subject of another story.